Team Infinity Factor watches their robot during competition at the Massachusetts First Tech Challenge State Championships at Natick High School. 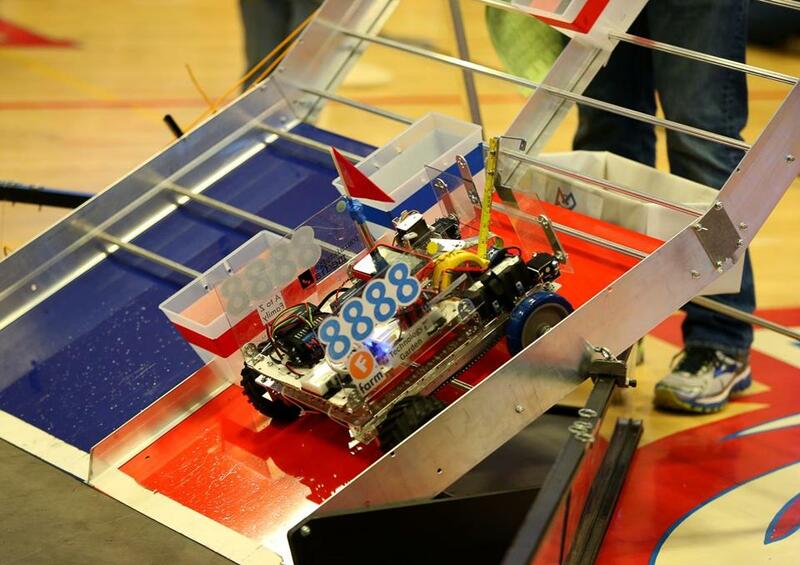 NATICK — With a whistle and a whirl of its motor, robot 8888 used its wheels to ascend the steep metal plank inside the square arena. At the push of a button, an arm made of a tape measure emerged from the body, rising up to a metal bar. Once the end of the tape measure latched onto the bar, the robot hoisted itself up slowly, as if performing a pullup. With the robot — a cube-shaped collection of wires and metal — now hanging from the bar, team Infinity Factor from the Hollis Montessori School in Hollis, N.H., erupted with excitement. The crowd watching from the nearby bleachers cheered them on. Infinity Factor was one of 32 registered teams from New England competing in the FIRST Tech Challenge state championships on Saturday, at Natick High School. In order to compete at the event, each team had to qualify in one of five similar robotics competitions held earlier this year. Teams on Saturday hailed from New Hampshire and Massachusetts. 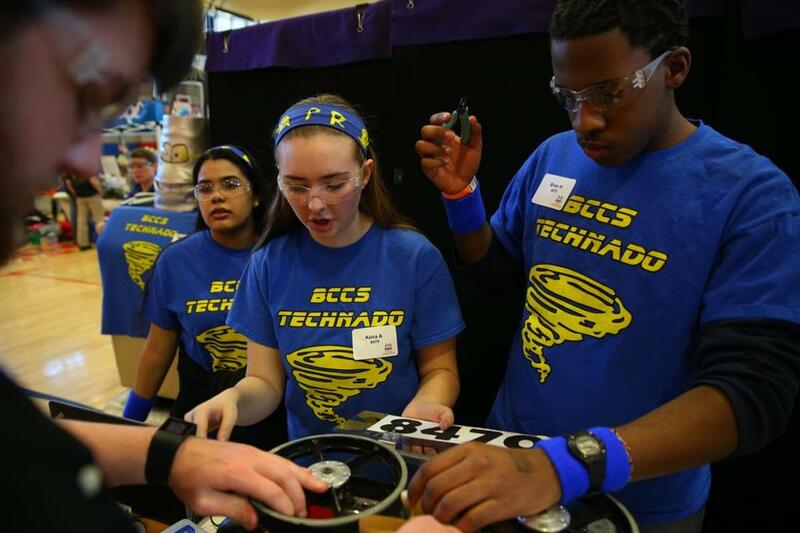 Team Technado, from the Boston Collegiate Charter School in Dorchester, was the only school from the city to compete at the daylong robotic showdown. The team of 12 students built a four-wheeled mechanism with plexiglass sides and a metal arm capable of dropping objects into a bucket. It was the school’s second year competing at the state championships. Last year, the team won the prestigious “Inspire Award,” which is given to the group that best “embodies the challenge of the program,” according to organizers of FIRST Tech Challenge. Seven teams will advance to the East Super Regionals, in Scranton, Pa., next month. There, they will compete with 65 other teams for a spot in the organization’s world championship games, held in late April in St. Louis. 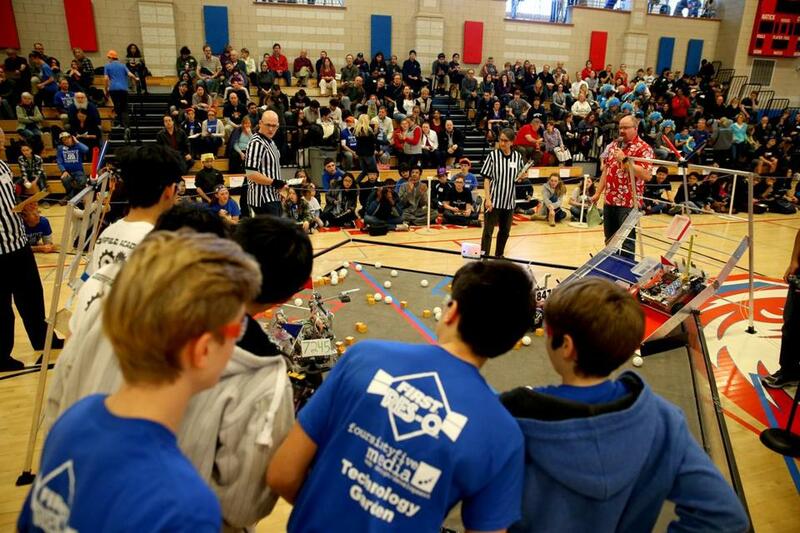 There were two ways for a team to win one of the seven coveted slots at the state championship event Saturday, said Loretta Bessette, the state affiliate for the FIRST Tech Challenge in Massachusetts. Above, Keira Ahern and Brian Hall from Boston Collegiate Charter School worked on their robot before the competition started. Teams earn top honors either by dominating their rivals inside the walled arenas, set up on the gymnasium’s floor, or by impressing a panel of judges during an interview process at the event and winning awards. Each round inside the arenas on Saturday began with a 30-second autonomous period, where the robots had to perform pre-programmed tasks without the guidance of the student engineers and programmers. After that period ended, teams huddled around the 12-by-12-foot battlegrounds using game controllers, which were connected to Android phones that sent signals through a Wi-Fi network to a second phone attached to the robots, to give directions to the custom-made devices. The robots could be directed to pick up yellow cubes and Wiffle balls and deposit them into buckets; climb up steep metal ramps; “rescue” plastic figurines from the top of a zipline to safety; and use levers and arms to reach up and latch onto a set of bars at the top of each ramp. Between rounds, students hunched over their robots like pit crews around a race car, tinkering with parts and checking wires to prepare the machines for the next match. On the other side of the gymnasium, away from the competing teams, booths were set up where students could display their projects, and test them in the practice ring. Members of team GearTicks, an independent group of students who live in Lincoln, built their robot “Moose” to perform the contest’s most difficult tasks: scaling the ramps and clasping the overhead bars — the same task that robot 8888 performed to perfection. “We based our robot design off of doing those things,” said Calvin Terpstra, 17. The group’s complex design, which was built around a customized drive-system, helped advance the team to the final rounds. “I think it has totally paid off,” said Terpstra. Team Infinity Factor's robot during competition at the Massachusetts First Tech Challenge State Championships at Natick High School.